يشكل فندق Auckland Airport Kiwi Motel بموقعه الممتاز في قلب مطار أوكلاند نقطة انطلاق ممتازة لاستكشاف أوكلاند. يمكن من هنا للضيوف الاستمتاع بسهولة الوصول إلى كل ما تقدمه هذه المدينة النابضة بالحياة. 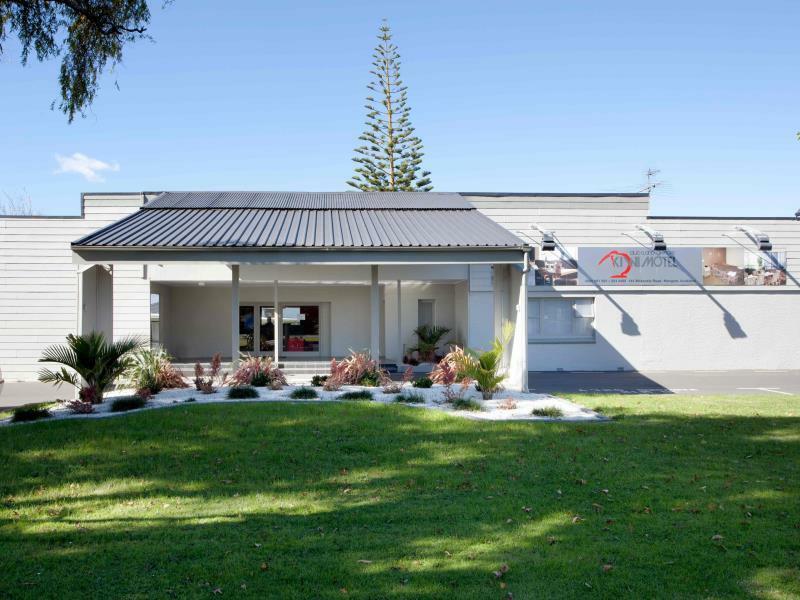 يضفي محيط الفندق اللطيف وقربه من مانجيرا جبال, Hillcrest Hospital, Mangere East Medical Centre سحراً خاصاً على هذا الفندق. كما يقدم Auckland Airport Kiwi Motel الكثير من الخدمات لإغناء رحلتك في أوكلاند. يمكن لضيوف الفندق الاستمتاع بالميزات التالية على أرض الفندق: واي فاي مجاني في جميع الغرف, تسجيل وصول/خروج سريع, تخزين الأمتعة, خدمة الغرف, التوصيل من وإلى المطار . استمتع بوسائل الراحة الراقية في الغرف أثناء إقامتك هنا. بعض الغرف تتضمن اتصال لاسلكي بالإنترنت, اتصال لاسلكي بشبكة الإنترنت (مجاني), غرف لغير المدخنين, تدفئة, مكتب لمساعدتك على استعادة طاقتك بعد يوم طويل. يقدم الفندق مجموعة رائعة من الخدمات كمثل مسار جولف - ضمن 3 كم، لجعل إقامتك تجربة لا تنسى. يشكل Auckland Airport Kiwi Motel بخدماته الراقية وموقعه الممتاز، قاعدة مثالية للاستمتاع بإقامتك في أوكلاند. تتاح خدمة انتقالات المطار (الحافلة الصفراء) من الساعة 04:00 صباحًا إلى 01:30 صباحًا يوميًا، ويغادر كل 30 دقيقة. تحتوي جميع الغرف على مضخة حرارية (مكيفة بالكامل). The stay was pleasant, The bed and the room were good but the receptionist who checked us in did not tell us breakfast was from 7 am - 9 am. We were tired the 2 nights before traveling from Seoul to Kuala Lumpur to Sydney and finally Auckland. We missed breakfast and was actually hungry by the time we picked up our camper. However, the Indian lady who was the receptionist in the main building was excellent. We would say the accommodation is 3-Star and the service pretty good. No comments on food as we did not taste. I would stay here again if I need accommodation next. Just overnighting in Auckland prior to driving down to Rotorua. I had stayed here prior for business and does the job. Good sized rooms and beds. All you need for a quick stay. Quiet and convenient with free bus transfer to/from the hotel 24hrs a day. Would stay here again for a quick stay close to the airport. The motel and hotel are of the same group. They are in the same big compound with ample parking spaces. 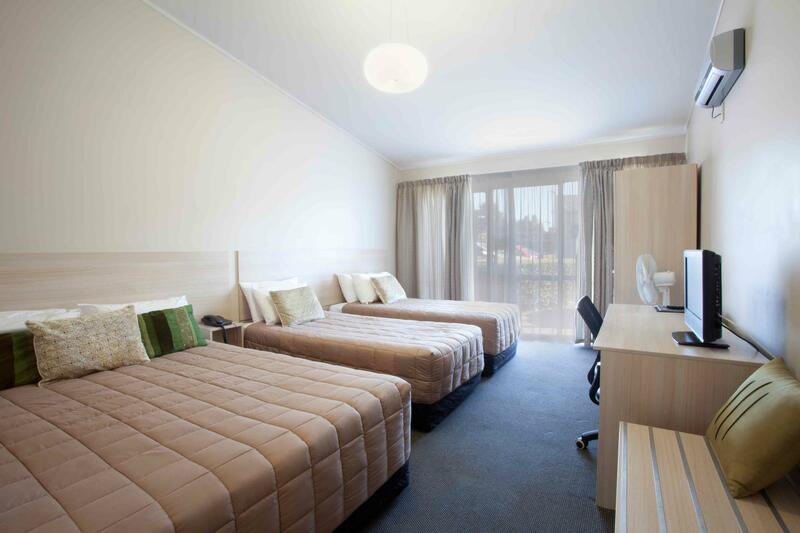 They also have dorms for backpackers. 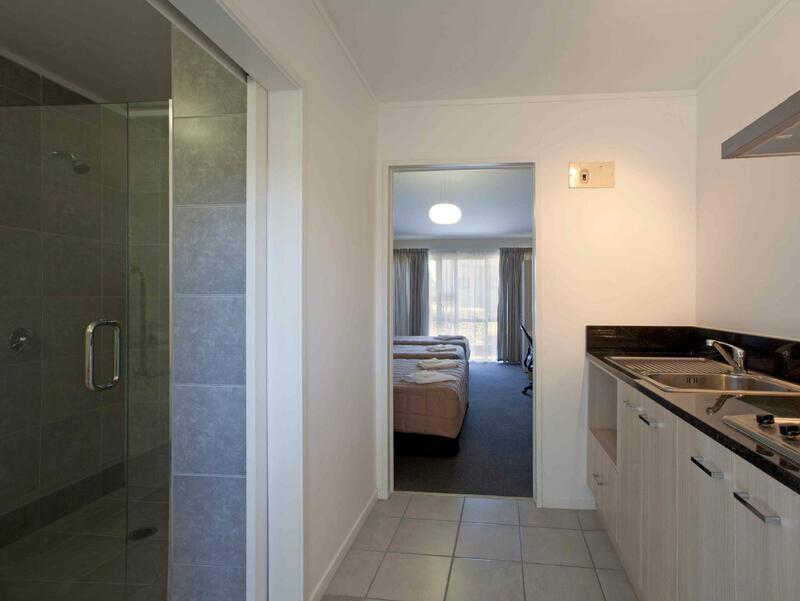 We had a family rooms which is big and bright. 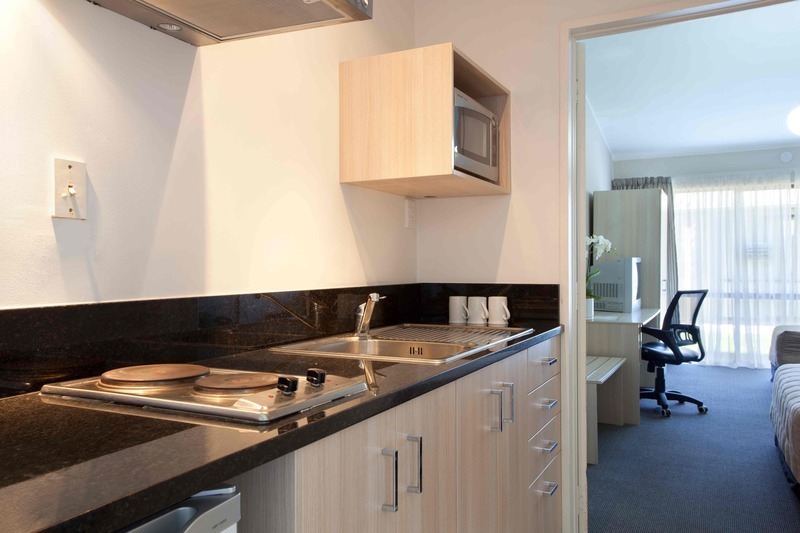 It comes with a kitchenette with sufficient utensils and crockery to make a decent meal. The beds are medium firm but without an electric blanket, especially this is winter time. However the aircond unit could be tuned up to give warm air. The hot shower is slightly difficult to adjust, and inconsistent in the temperature of the water. Free WiFi is limited to 500mb. You need to buy more data after the first 500mb. Toilet was cold in the morning. Simple toiletries such as toothbrush and paste and soap/shampoo were available. There is also an ironing board with iron. Hair dryer is also available. Customer service is satisfactory. We purchased also breakfast which comes in the form of continental breakfast - cereals and toasts. 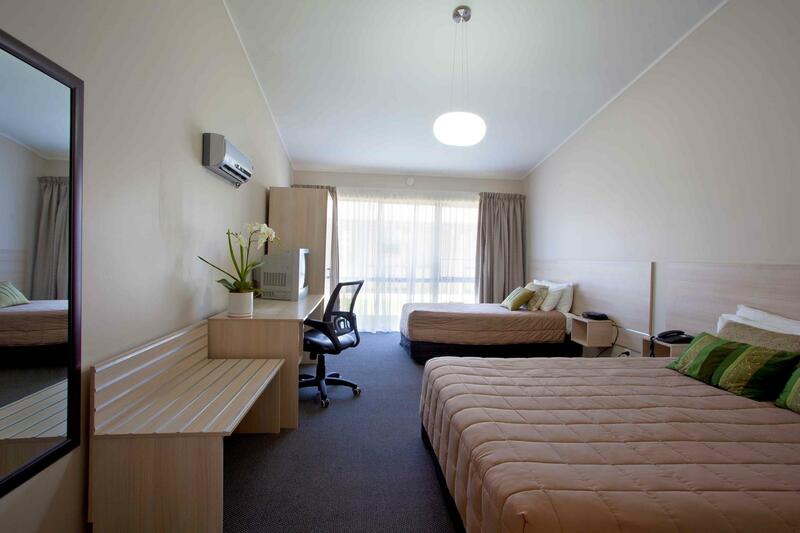 Overall, we are happy with the room and would recommend this hotel-motel. It is very convenient to get to the center of the town. However I think they need to provide more parking space. The interior was old, I can feel the bed had been used for many many years as the surface was not flat anymore, so it was not that comfortable to sleep. However the view was great though. 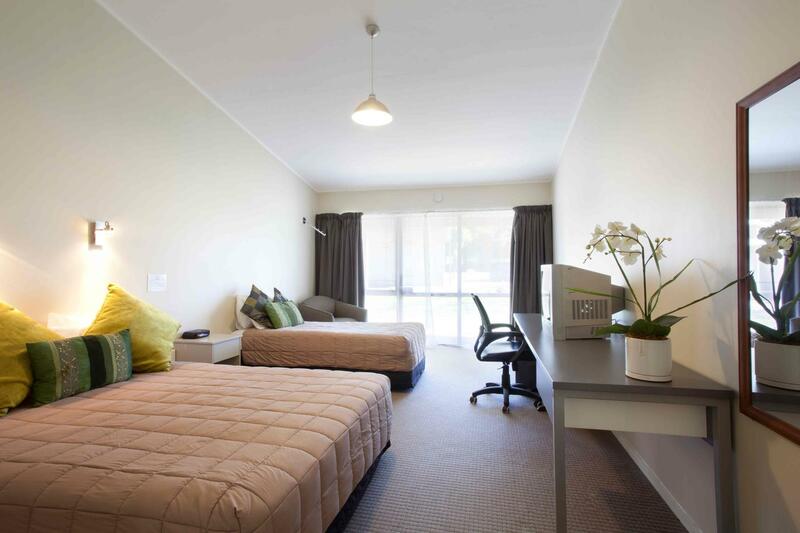 Good location, near to Auckland International Airport. Very dated. Needs doing up. No pressure in the shower, hole in wall had been patched up with plaster, not sanded back or painted. Huge bow in long table in friends room next door. Only wort $80 - $85 a night max, not the $100+ that we paid. Very disappointed. Would never stay again at that price. I had a family trip and Stayed there for 3 Nights. Few issue I have identified. 1. TV didn't have enough channels to keep kids Busy 2. Mosquitoes in the Room 3. Shower Water Pressure was too low 4. Toiled was cleaned every 2nd day but the Toilet Pan wasn't cleaned properly. Motel had everything we required for our overnight stay before an early flight the next morning. Appreciated the courtesy wake up call. Convenient shuttle bus to airport for $2 each. Second time we have stayed here. A rooster in the neibourhood wakes you up at 5 am and never shuts up! Water pressure in the shower is reduced to a pathetic trickle and it's nearly impossible to regulate temperature. The room has very dated furnishings and a depressing feel about ut. Airport have shuttle to hotel and hotel to airport. Good service. 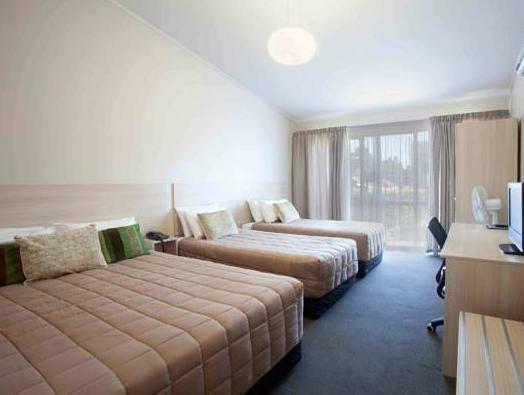 No recommend ...Wi-Fi for free only 500mb...dirty and not comfartobel,price for room very expensive ($144 NZD),beds is old,cheers broken,We are not happy...never more stay in this place. We spent 3 nights there in a one single bed and one queen bed room. The location is good as it’s close to the airport (about 10mn drive from domestic and international terminal). However, the facilities is poor. The hotel show that there will be free wifi access to guest however it’s not really true as each guest only allow for 200MB of usage and subject to limit only one device per guest. Just because I expected unlimited internet usage once I arrived this hotel I kind of disappointed as the advertised information is wrong.